Right now, I am always tired. Transition is exhausting. A week plus a few days since we returned from Boston (it feels like a month ago. No, two!). Julia will go to Newton South High School. I was very impressed with the Sped program chair who sat with me for over two hours, explaining her program and answering my questions. Three distinct programs for students on the spectrum and a fourth program for kids who need a bit of column A and some of column B. I think that is where Julia will fit in. 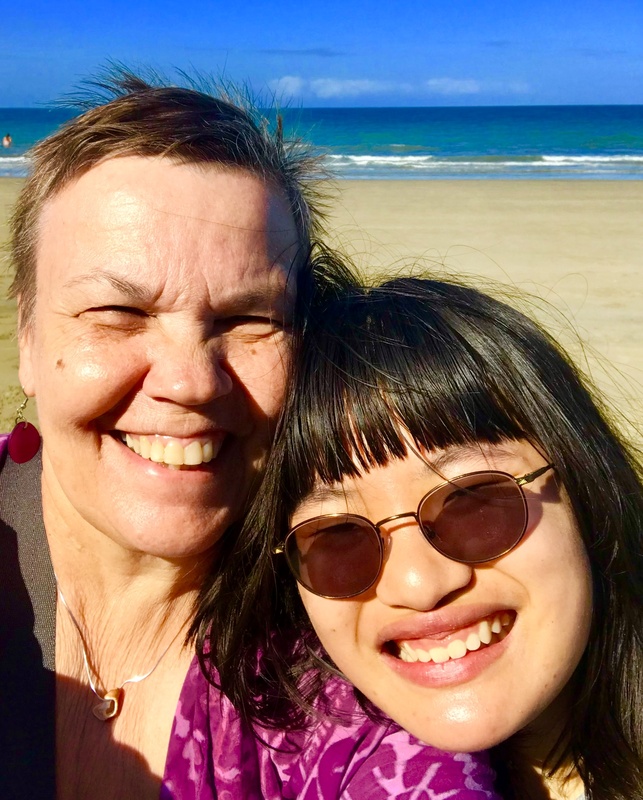 She asked me to consider courses that I had not thought to offer to Julia and for the first time since middle school, I felt there might be someone else paddling Julia’s education boat. This was a gorgeous feeling, like burdens falling off my back and down the attic stairs, a là Lousia May. So much of the time, I am advocating from my gut, not from any knowledge of best practice. I am not expecting perfection but a bit of real support in decision making and in practice would go far. Julia liked the school. We did not get a tour of this one but we peeked in classrooms and Julia spotted a few cute boys. Possibly the cute boy siting was sufficient to quell her fears. The tour and discussion with Arlington High School, earlier in the trip was also satisfactory. I like the town of Arlington better than Newton (no deep knowledge of either town, so no real judgement), I liked the UU Arlington Church that we attended on Sunday. The school was fine and I’m sure Julia would have done okay there, but Newton was organized and knowledgeable. I think I was choosing between two solid choices. With that decision, the apartment possibilities are limited to the school district. The ‘southern’ part of Newton is the district with many more small single family houses and fewer rentals than the other school districts in the final four. The RE agent assured me that there would be plenty of apartments to chose from. Not so much right now and so something to worry about. Do I always need something to worry about? A possible addition to the year’s resolutions: work towards diminishing the worry reflex. Especially about my favorite worry topics: things that are absolutely beyond my control. My poor crazy self, bouncing from one worry to the next. I took a solid two week break from sorting, culling and packing, from arranging and making the house into its perfect non-us home. Back at moving prep this week. Starting slowly. Tuesday, I packed winter clothes. Coats, most sweaters, hats, gloves, scarves and boots fit into two of large plastic tubs. I usually just shift clothes in closets. As I closed the tubs, I wondered where I would be hanging the coats next autumn. I do that wondering over and over, not a bad thing. Just a musing. Curious at what is coming. Today, I pulled some of those things out again. Snow, hail, rain and wind so intense that it shakes the house. Coming home after the week in Boston, I was somewhat shocked to see the home I had arranged. Staging for sale remains disconcerting. I put down the rugs again, brought my bedroom chair and my file cabinet from the basement, hung a few pictures where there were still nail holes, but basically the house looks closer to its staged self than my cozy home. It surprised me and we then we adapted. Not home but where we live right now. Allowing myself to run out of a few staples. I usually have at least two or three kinds of mustard in the fridge: something grainy, something smooth and/or spicy. I wanted a cucumber salad for tonight and looked to take out ingredients before cutting into the cuke. And lo, no mustard. Certainly, I will replenish but a slimmer store of staples is a near unconscious aim. Next up: sorting through the three file boxes of Julia school years. I don’t need to keep every behavior chart, in chronological order, that she has gotten during grammar school. Goal: one box. This will be going to go on for the next 81 days. More or less. Last week, I said good-bye to the guy at Zimbrick Honda who has been in charge of maintaining my car for the last 12 years. He was very sweet. He printed out my car repair history and told me to call him if I wasn’t finding help I could trust. The interchange tugged at my heart in ways I did not expect. Oh my, no part of this is easy. Of course, there are no hard answers. Not yet. I have let go of when I will know for sure. At least, until there is a lease signed and a moving company contracted. All I know is that I will know before 81 days are up. Confronting over and over how much community I am leaving. Feeling in awe of the boldness that David and I showed as we moved from the east coast to Indiana and then to Wisconsin. I see now that we could be fearless because we carried our community within ourselves. We left dear friends in each place and we missed them, but our family unit remained intact and we could remember what we had left behind together. Doing this alone is different. Lines of love and support are blurred and I am not taking my community. It is a learning. Is a practice. Nothing stays the same; everything changes. I know, I know. But, but, but . . . I have made all the decisions. One day, a moving van will pick up what I box, Julia and I (and Muta, the cat) will drive away. We will let go of what is here and go to our somewhere else. Something will be left behind. I hope there are angels on hand to catch us as we dare this leap. We finally have an offer on our old home and closing is coming up fast; we’ll be heading up to clear the last bits of “personal” items out. It’s hard when it’s been HOME for so long and you worry if the next folk will be kind to your “baby.” It’s a difficult time, so I’m sharing that with you. Saying good-bye to folk is really tough, hoping some come visit-heck, we’re only 4-5 hours east. Good luck and I cheer you in spirit for the upcoming adventures you and Joy will share.